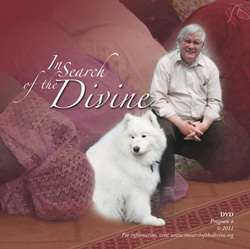 The sixth edition of In Search of the Divine features pet therapy teams Dave Kettering and his Samoyed dog, Sasha, and Becky Martini and her Lhasa Apso dog partner Zoey. Both teams explain the Divine nature of their work and the powerful impact their dog partners have in offering care, love and healing to the sick. Lisa Gidlow Moriarty talks about labyrinths as a prayer form. Ginger Hedstrom explains the Christian history of clowning and how this art form led her out of the pain of abuse. And we examine Christian and Muslim daily prayer forms with Sister Jeron Osterfeld, OSB, the Sisters of St. Benedict at St. Paul’s Monastery and Makram El-Amin of Masjid An’nur Mosque in Minneapolis. Request a copy or make a comment about this program. The following are brief clips from episode #6 of In Search of the Divine.